Whirlpools have fascinated writers, artists and scientists since antiquity. I can still remember sitting on the edge of my chair of pure excitement when I was reading how Odysseus confronted the dreadful Charybdis and only just managed to navigate his ships passed it. Now, thirty-five years later, the story still enthrals me and it passes my mind every time I point my telescope slightly south of Alkaid, the outermost star of the big dipper. There you'll find the spectacle that you can see on this sketch. 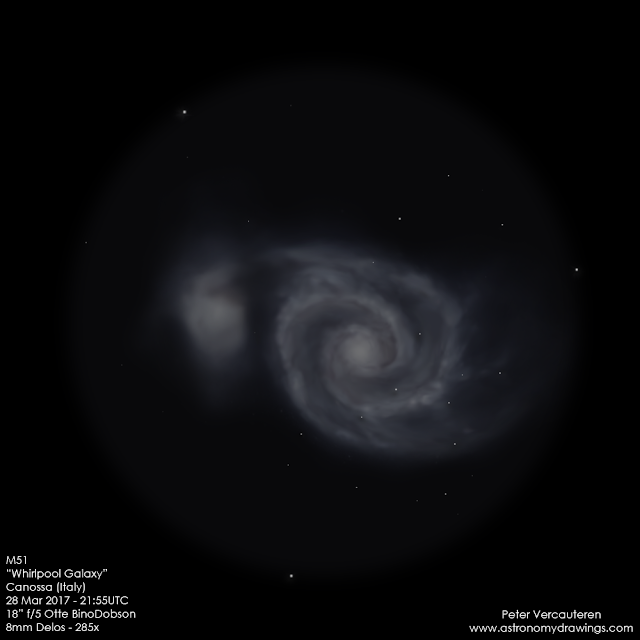 M51, or the "Whirlpool Galaxy", are in fact two interacting galaxies as you could've guessed. 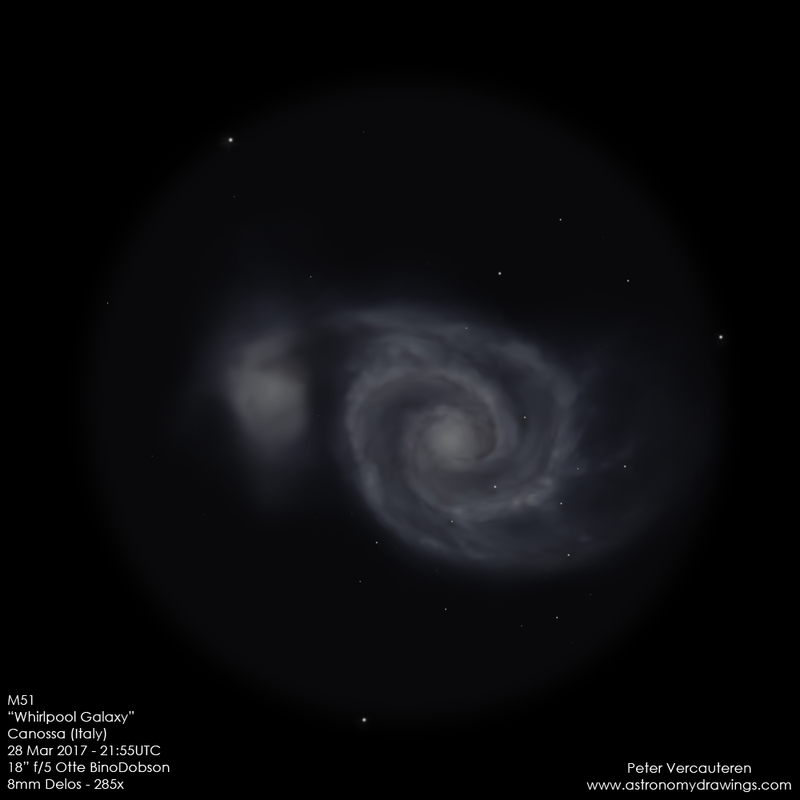 The little companion, otherwise referred to as NGC5195, came from behind M51 and literally passed through its disk some 500 million years ago. After that it made another disk crossing as recently as 50 to 100 million years ago and currently it lies slightly behind its big sister. Loyal readers of my blog will already have concluded that these events have led to intense bursts of star formation, due to the violent stirring up of matter in both galaxies, and that's exactly what we see here. Look at all these bright knots and patches in the Whirlpool's spiral arms! Those are all vehement star nurseries like the Orion Nebula, but much bigger still. The spiral arms themselves have also been deformed by the close encounter with the dwarf galaxy and aren't perfectly circular. Furthermore I was able to note some very faint nebulosity around the little one and on the right of the main galaxy where the outer spiral arm was clearly torn to pieces... all stars and matter that have been extracted from both galaxies under the unimaginably strong tidal forces of the two fly-throughs. Jupiter and the effect of "seeing"